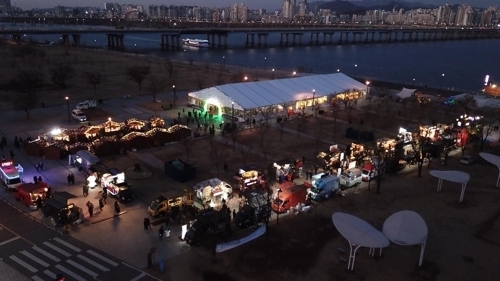 “Seoul Hot Winter Market” is set to take place at Yeouido Han River Park from Tuesday to Friday, Seoul Metropolitan Government said Friday. The market will feature about 30 food trucks that sell exotic dishes from all around the world, such as tacos, pad thai, sushi and steak. Visitors can buy handmade accessories and home decorations from 130 market booths installed at the park. Musicians will busk every 6 p.m. and 8 p.m. The market will be open from 5 p.m. to 10 p.m. on weekdays and 3 p.m. to 9 p.m. on weekends. According to the city, over 200,000 people visited “Seoul Christmas Market” so far, which is being held by the city from Dec. 15 to 31 at Yeouido, recording 670 million won ($ 629,800) in sales.